In the ongoing Mormon Apologist Wars on the location of the Book of Mormon lands, one advocate of the LGT (Limited Geography Theory) is Michael Ash. 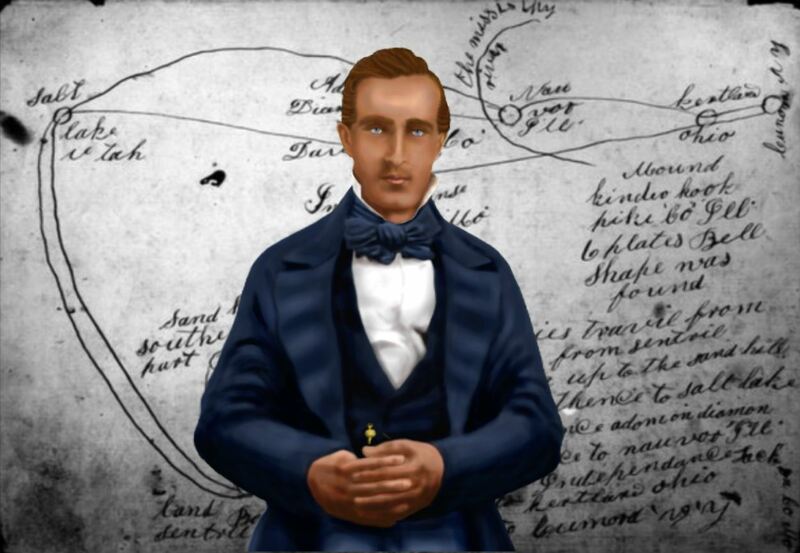 In February of this year, he published an article entitled, “How Moroni and the plates may have made it to Hill Cumorah.” He postulates that Moroni traveled from Mesoamerica to New York, and could have done it in under a year. In fact, we are told that Moroni, while on his way to drop off the golden plates he lugged all the way to the Hill Cumorah in New York (named he says, after another hill of the same name located somewhere in Central America), Moroni stopped in (present day) Arizona, then went on to Salt Lake; afterwards going to Missouri (Independence & Adam-Ondi-Ahman) continuing on to Nauvoo and Pike County in Illinois, and, before getting to New York, stopped in Kirtland Ohio! 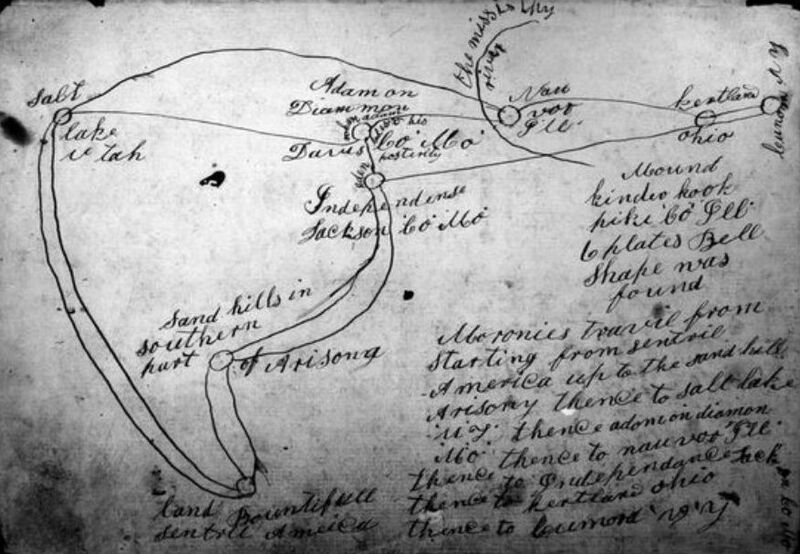 Why would these same men, who discount statements by Joseph Fielding Smith, Oliver Cowdery and others, that there was only one Hill Cumorah, (located in New York State), give credence to one statement by Brigham Young about Moroni traveling to Utah – and this map, (purported to have been drawn at the direction of Joseph Smith), while discounting the multitude of statements that locate the Hill Cumorah in New York? What I found the most interesting about all of this was the side trip that Moroni took to Pike County Illinois. 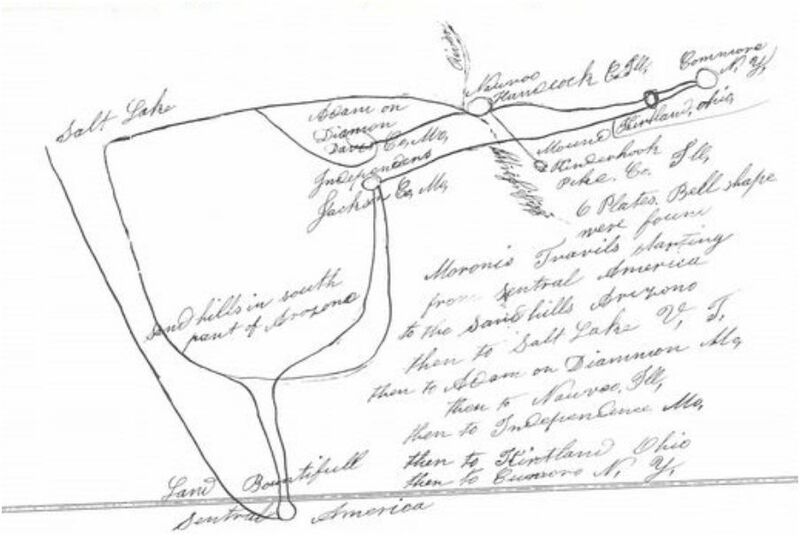 If anyone is familiar with Mormon History, they will remember that an interesting discovery was found there, known as ‘The Kinderhook Plates’. If this map is genuine, and Moroni went there, why would he go to a place where phony plates were buried in an attempt to fool Joseph Smith? *This article originally appeared at Mormon Coffee. Recently Timmy Berman posted another one of his whining rants on his blog, where he tries to garner sympathy for his cyber-bullying by trying to play the victim. (Wah!). This was brought to my attention by numerous friends, and my attitude has been, “who cares?” My article Wanna Bee, speaks for itself and people are free to draw their own conclusions from the article. But Timmy just can’t seem to shut up, and has been up to his old tricks of making accusations and drawing conclusions without any evidence, and so I thought I would set the record straight. 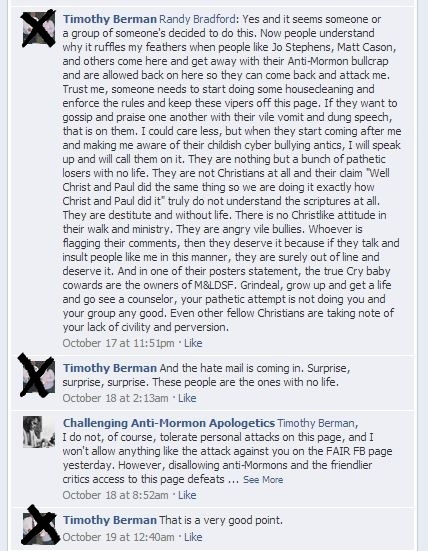 First though, Timmy made these comments on a page that he loves to frequent, and here they are for your perusal. This little exchange was brought to my attention earlier this morning. A couple of things I noticed are (1) nowhere does Timothy Berman admit to being behind “flag attacks” against anybody; and (2) somebody there seems to think that Cornelius St. Bartholamew (who I see joined this page earlier this morning) is the same person as our Mr. Berman. 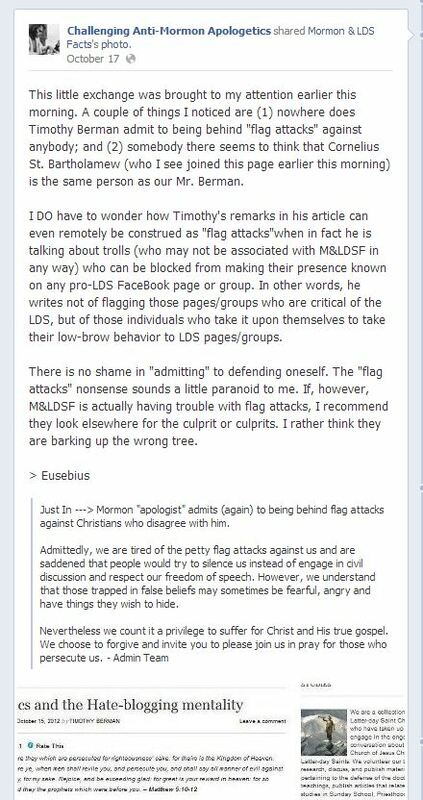 I DO have to wonder how Timothy’s remarks in his article can even remotely be construed as “flag attacks”when in fact he is talking about trolls (who may not be associated with M&LDSF in any way) who can be blocked from making their presence known on any pro-LDS FaceBook page or group. In other words, he writes not of flagging those pages/groups who are critical of the LDS, but of those individuals who take it upon themselves to take their low-brow behavior to LDS pages/groups. There is no shame in “admitting” to defending oneself. The “flag attacks” nonsense sounds a little paranoid to me. If, however, M&LDSF is actually having trouble with flag attacks, I recommend they look elsewhere for the culprit or culprits. I rather think they are barking up the wrong tree. 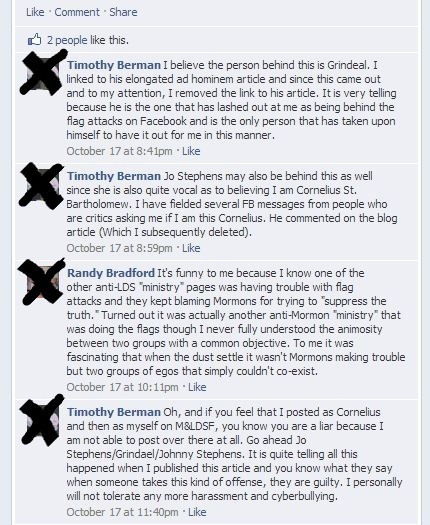 Just In —> Mormon “apologist” admits (again) to being behind flag attacks against Christians who disagree with him. Admittedly, we are tired of the petty flag attacks against us and are saddened that people would try to silence us instead of engage in civil discussion and respect our freedom of speech. However, we understand that those trapped in false beliefs may sometimes be fearful, angry and have things they wish to hide. I believe the person behind this is Grindeal. (sic) I linked to his elongated ad hominem article and since this came out and to my attention, I removed the link to his article. It is very telling because he is the one that has lashed out at me as being behind the flag attacks on Facebook and is the only person that has taken upon himself to have it out for me in this manner. Wrong Timmy. (Wah!). Though I have been a part of Mormon & LDS Facts in the past, I ceased to have anything actively to do with the page months ago, because I have been in the hospital having surgery and recovering from that, and no longer wish to take the time to run the daily operation of a Facebook Page. Instead I’m doing research and writing for this blog and finishing two books, that will appear shortly. You can attack me all you want, but it won’t do you any good, because I’m no longer tied to the M&LDS Facts Page in any way. Have fun. But your problem is not with me, it’s with others that your bullying is being noticed by, and by your own admissions. I’m not Jo Stephens. (Wah!). 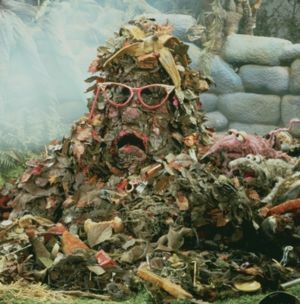 From what I understand there is credible evidence that you were indeed Cornelius, but I’m not interested in pursuing any sock-puppet profiles you may have invented to carry out your bullying. Oh, and if you feel that I posted as Cornelius and then as myself on M&LDSF, you know you are a liar because I am not able to post over there at all. Go ahead Jo Stephens/Grindael/Johnny Stephens. It is quite telling all this happened when I published this article and you know what they say when someone takes this kind of offense, they are guilty. I personally will not tolerate any more harassment and cyberbullying. Me thinks you protesteth too much. (Wah!) And my name is Johnny Stephenson. All this time and you still can’t get it right? LOL. I’m not offended at all. I don’t wish to get into any discussions with you because all that comes out of your mouth is trash. That is why your comments won’t be published here, and you can go holler and scream and gnash your teeth to anyone you care to. Good luck with that. But your past bullying will stay up for all to see, because you keep trying to blame it all on everyone but yourself. Whoever transgresses and does not abide in the doctrine of Christ does not have God. He who abides in the doctrine of Christ has both the Father and the Son. If anyone comes to you and does not bring this doctrine, do not receive him into your house nor greet him; for he who greets him shares in his evil deeds” (2 John 7-11). Yes and it seems someone or a group of someone’s decided to do this. Now people understand why it ruffles my feathers when people like Jo Stephens, Matt Cason, and others come here and get away with their Anti-Mormon bullcrap and are allowed back on here so they can come back and attack me. Trust me, someone needs to start doing some housecleaning and enforce the rules and keep these vipers off this page. If they want to gossip and praise one another with their vile vomit and dung speech, that is on them. I could care less, but when they start coming after me and making me aware of their childish cyber bullying antics, I will speak up and will call them on it. They are nothing but a bunch of pathetic losers with no life. They are not Christians at all and their claim “Well Christ and Paul did the same thing so we are doing it exactly how Christ and Paul did it” truly do not understand the scriptures at all. They are destitute and without life. There is no Christlike attitude in their walk and ministry. They are angry vile bullies. Whoever is flagging their comments, then they deserve it because if they talk and insult people like me in this manner, they are surely out of line and deserve it. And in one of their posters statement, the true Cry baby cowards are the owners of M&LDSF. Grindeal, grow up and get a life and go see a counselor, your pathetic attempt is not doing you and your group any good. 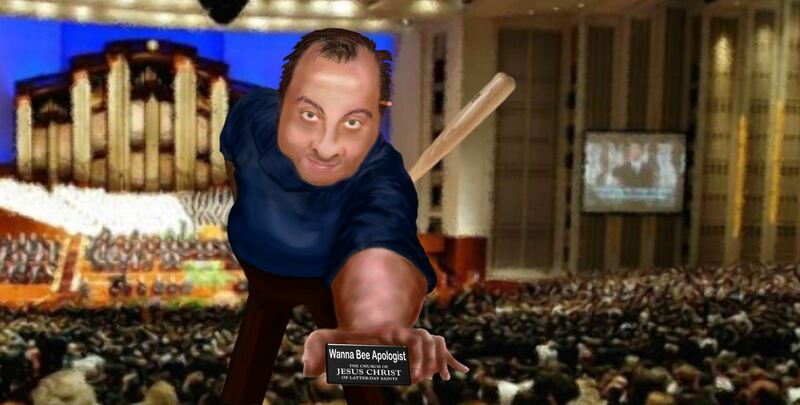 Even other fellow Christians are taking note of your lack of civility and perversion. Actually, I haven’t been on Don’s page in a long time. I don’t care about attacking you on Facebook. I’m only responding to your attack on me here (again) which gets far more notice. You see, you started all of this. The evidence is there in my article Wanna Bee, and you can’t stand that it shows you are a liar and a troll. Even though you’ve tried to cover your tracks by deleting some of the links, and then whining about it, people are smart, and will judge for themselves who is telling the truth. Timmy, you had a chance to make all this go away, but you kept up the attacks and the bullying and the lies on your blog. Too bad. The article will stay up until you repent, apologize and admit on your blog that you were wrong and that you slandered me and others. And the thing that is sad is that YOU ARE STILL DOING IT. And if my article isn’t doing any good, why do you continue to whine about it? And the hate mail is coming in. Surprise, surprise, surprise. These people are the ones with no life. What do you expect when you act like a troll? (Wah!) My advice, get rid of your computers, phones and anything to write with and someday you might stop looking like an ignorant fool and people will stop commenting on your articles (why they would after knowing who you are, is beyond me) and you can then stop whining about “hate mail”. If you think about it, the fact they wrongfully attack you and blame you for the flagging is actually funny. I (sic) shows how little thinking they actually put into what they say and do. Essentially, they are condemned by their own words, shown for the fools they just might be. 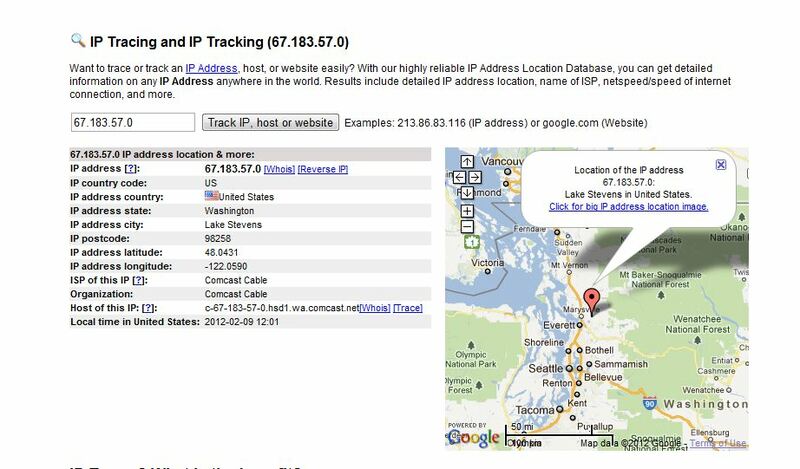 You and I both know you aren’t behind the flagging attacks. If they cannot see that, then it is obviously their problem. That Grindael has chosen to go after you for things you may or may not have done prior to getting your life straight only shows they lack a primary Christian attribute: The ability to forgive. Again it is their loss, and something they will have to face on Judgement Day. Another thing worth considering is the fact that their online behavior can bite them in the end. In this day and age employers and potential employers can simply noodle about on the internet and find what these people post. Those who are cyber-bullies or are simply narrow-minded and bigoted can be found out. As a result, they can ofttimes lose their jobs or otherwise have their employment potential sharply curtailed. The job market is far less forgiving than God is. I’m retired Donald. So much for that idea. As for forgiveness, well, there has to be some kind of repentance involved first, and Timmy is still as trollish as ever. (And yes he did what I documented in my article). As for you knowing that Timmy isn’t involved in trolling and flag attacks, well, even your prophet didn’t know that he was being snowed by Mark Hoffman. I don’t have much faith in the Mormon ability to discern people, so if you want to believe a liar, hypocrite and bully, go right ahead, but again, my article speaks for itself and I invite all to read it for themselves and judge me accordingly. But there were also false prophets among the people, just as there will be false teachers among you. They will secretly introduce destructive heresies, even denying the sovereign Lord who bought them—bringing swift destruction on themselves. Many will follow their depraved conduct and will bring the way of truth into disrepute. In their greed these teachers will exploit you with fabricated stories. Their condemnation has long been hanging over them, and their destruction has not been sleeping. For if God did not spare angels when they sinned, but sent them to hell, putting them in chains of darkness to be held for judgment; if he did not spare the ancient world when he brought the flood on its ungodly people, but protected Noah, a preacher of righteousness, and seven others; if he condemned the cities of Sodom and Gomorrah by burning them to ashes, and made them an example of what is going to happen to the ungodly; and if he rescued Lot,a righteous man, who was distressed by the depraved conduct of the lawless (for that righteous man, living among them day after day, was tormented in his righteous soul by the lawless deeds he saw and heard)— if this is so, then the Lord knows how to rescue the godly from trials and to hold the unrighteous for punishment on the day of judgment. This is especially true of those who follow the corrupt desire of the flesh and despise authority. Bold and arrogant, they are not afraid to heap abuse on celestial beings; yet even angels, although they are stronger and more powerful, do not heap abuse on such beings when bringing judgment on them from the Lord. But these people blaspheme in matters they do not understand. They are like unreasoning animals, creatures of instinct, born only to be caught and destroyed, and like animals they too will perish. Your profile at Literotica was last edited in 2005, not your posts. You must think people are stupid, Timmy. Thanks though, for letting us know it really was yours. Now go and whine some more Timmy. (Wah!) Now you have more to whine about as you continue to wallow in the mud. Now Notice the date for that post is April 28, 2006. 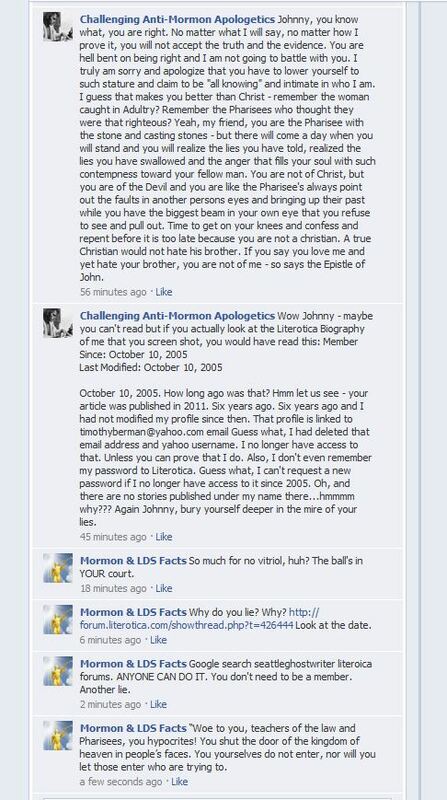 If Timmy says that he wasn’t a Mormon then, why does he say so here, on February 4, 2006? “My particular religious belief is that of the LDS Faith (Mormonism). It seems that Timmy just can’t keep his lies straight. Note: A rogue is defined as a a dishonest or worthless person : scoundrel. How apt for the Wanna Bee to use this moniker; but this is typical of those that don’t understand how to apply context in relation to word associations (such as “Rogue Apologist”.) As Forest Gump would say, Stupid is as stupid does.